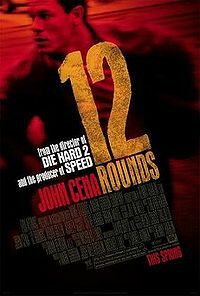 From the director of "Die Hard 2" and the producer of "Speed" comes 12 ROUNDS, starring John Cena as New Orleans Police Detective Danny Fisher. When Fisher stops a brilliant thief, Miles, from getting away with a multi-million-dollar heist, the thief's girlfriend is accidentally killed. After escaping from prison, the criminal mastermind enacts his revenge, taunting Danny with a series of near-impossible puzzles and tasks ...12 rounds...that Danny must somehow complete to save the life of his fiancee. Ranging from tests of intelligence to Sisyphean tasks of endurance, Miles keeps Danny guessing at every treacherous turn. Each new round sends Danny hurtling through the city at a breakneck pace. As Miles toys with Danny, innocent citizens are threatened. Automobiles, streetcars and ferryboats are transformed into potential weapons of mass destruction. With the violent rounds mounting, one wrong move may take the match closer to a deadly conclusion.